This past weekend, there was big and shocking news for the classical music world: the Philadelphia Orchestra filed for bankruptcy. The Philadelphia Orchestra. I say "shocking news"; maybe better-informed folks were less than surprised, but I was both taken aback and deeply distressed. The most detailed response I've seen in the news comes from Peter Dobrin in the Philadelphia Inquirer. Musicians distributed leaflets and staged "play-ins" before the board's declaration of bankruptcy; in the aftermath, the official message of the orchestra carried unpleasant overtones of desperation. As if that weren't enough, the American Federation of Musicians has denounced the move. The orchestra's Twitter account continues to try to drum up support. Its website says they're restructuring. Under these messy and murky circumstances, I'm disinclined to obey the frantic plea for financial help. But I resist this plea only by gritting my teeth and repeating, mantra-like, "solution for the musicians, solution for the musicians." Because I do love the Philadelphia Orchestra. I think of it not only as the, but as my Philadelphia Orchestra. And to relieve my mind, and in deep gratitude to all the musicians who have made, and continue to make the orchestra what it is, here is why. 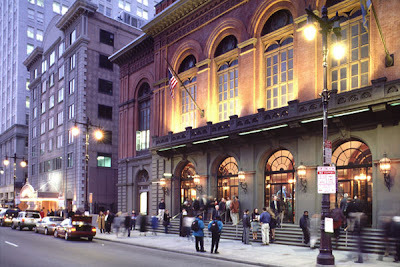 The Philadelphia Orchestra was my first orchestra. I don't remember the date of my first Saturday morning Children's Concert; I think I must have been around six. Going to the concert was always a ritual: getting up, getting dressed in my best (invariably, with white tights and patent leather Mary Janes) and going with my mother to meet my best friend Stephanie and her dad, who drove us all into the city. At some level, I still think of the steps of the Academy of Music as huge. To the interior I gave my instant love: the foyer had marble floors, and the giant staircases flanking it were carpeted in a loud, over-sized floral pattern which I thought was simply magnificent. I always took my time ascending and descending these stairs; it made me feel like Cinderella. Although there were always smiling ushers to hand out programs (which had line drawings inspired by the music on the covers; Stephanie and I would color them in afterwards,) I liked to take mine from the elegant fluted basins on the wall. And then there was that chandelier, and the painted ceiling. I don't, alas, remember details of my musical experiences, though I'm tempted to attribute my early passion for Beethoven's Seventh Symphony to this source. I remember, once we got past the grand stairs, charging up the boring ones to get to our seats in the Family Circle. I remember once being so irrepressibly excited by a concert that, when we spied the conductor downstairs, my mother told me to go up and say thank you (as an encouragement, I imagine, either to work the excitement off or overcome shyness.) So elated was I that, with only slight hesitation, I marched up to the man and tugged on his coattail to get his attention. The men standing with Riccardo Muti laughed; he didn't, but listened, and shook my hand. Once my younger sister and I had both reached a reliably non-fidgety age, my father took us in to rehearsals sometimes. I thought that Wolfgang Sawallisch was awfully picky. We got to go backstage, where all the musicians we saw were friendly, and I even got to hold a trumpet. Without the economies of children's concerts, visits became somewhat more rare, but the Respected Father would find some selection of unmissable events from the season brochure, and into the city we would all duly go. To what tends all this? My love for the Philadelphia Orchestra is based on something far more solid than nostalgia. Those childhood concerts gave me an appreciation for--an addiction to--hearing great music performed live by great musicians. Though I've never found anything to equal that floral carpet, I think it's fair to say that those concerts shaped me into a person for whom entering a concert hall feels half like entering a place of worship, and half like coming home. So not only for all the great experiences I've had with the Philadelphia Orchestra, but also for the great musical experiences I've had around the world, and might not have done if they hadn't taught a seven-year-old in Mary Janes to love concert halls and what went on in them, I am grateful. 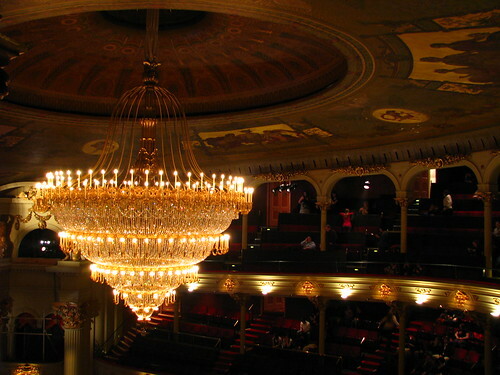 I'll be continuing to follow the story of how the Philadelphia Orchestra's future unfolds. And the instant I see a solution that looks supportive of its magnificent musicians, I'll pounce on it. Not only because it is the Philadelphia Orchestra, but because it still feels like my Philadelphia Orchestra. Since they summer up my way, I've spent a few evenings in that band's company. Sarah Chang at 12, that was fun. A Verdi Requiem with Tatiana Troyanos, who would not be with us much longer. A Four Last Songs with Jessye Norman - a lesson in how a real diva sets the pace no matter what the conductor's opinion. (That was the performance where my long-suffering roomie turned to me and said "I thought that voice was just a studio effect." Ha!) Since they went war-horse intensive, I kind of drifted away, but I hope to be looking forward to the Nezet-Seguin era. I lived in Philadelphia for the majority of the Eschenbach years and also have a great fondness for this orchestra. I even had a certain affection for Eschenbach, lugubrious tempos and cult-leader appearance included. Even though it was the discontent of that era that in part has led to the present-day problems, I heard many great concerts there. We would make pilgrimages for the alternate-years Rattle visits, we would talk each other into hearing obscure works, we would bring Indian take-out and have pre-show dinner in the Kimmel Center basement… I hope the management gets it together and doesn't completely screw the musicians over in the process. Right before I moved away they had a "best of the bests" concert where they performed "only the best" parts of all nine Beethoven symphonies in the first half of a concert, and then in the second half all the best bits of the Chaikovsky symphonies, and I began to get really worried. We weren't in the land of Sofia Gubaidulina premieres that we had been in before. OT: On my computer your blog's left margins are looking off--I'm missing the first few letters of each line. @stray Wow! Those are notable experiences indeed. Methinks any of these blogs could compile impressive "long-suffering roomie" stories. I was happy for them getting YNS... have no idea what to expect now, really. @Zerbinetta Ahhh, sounds like good times. What is it with Indian take-out that goes so well with concerts? That concert sounds deeply terrifying; almost a music-lover's dystopia of sorts. Clearly my Philly-going years predated both Eschenbach and sophisticated appreciation of programming. Thanks for the heads-up about the margins... not sure what to do about that but will mess around. Thanks for your comment in our blog. Next week I will be again in New York and I hope to see excelent opera performances at the Met!